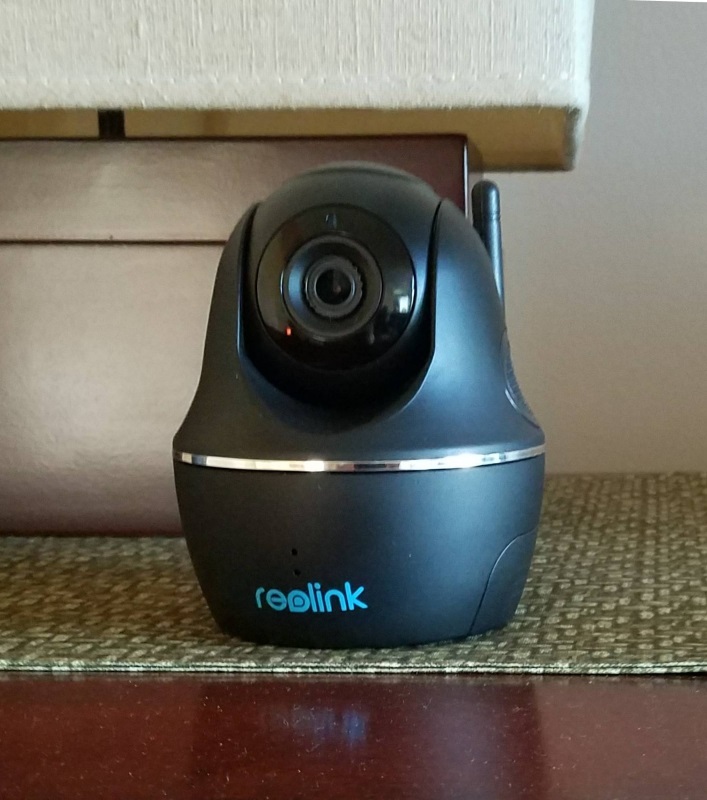 The Reolink Keen is a wireless pan and tilt camera. No power cables here. It’s fully battery operated. That leads us to some interesting mounting potential with this camera. Not being constrained by the need to mount it close to an A/C outlet means these be mounted in a lot of places. Just be sure it’s indoors though as the Reolink Keen is not waterproof. Like most pan and tilt cameras, the Reolink Keen is a large camera. Not surprising. A pan and tilt camera is always larger than a stationary lens variety. The camera measures almost 5 inches high by 4 inches deep and weighs almost 14 ounces. Any mount deployed for this camera needs to be heavy duty enough to hold the weight and size. Typically the Reolink Keen is placed on a flat surface like a table or shelf. You might be unaware of the presence of a mounting screw hole on the bottom of the camera. Turn the camera upside down and note the screw hole. That’s a standard 1/4″ – 20 threaded tripod screw hole. This means that many tripods and standard camera mounts will fit the Reolink Keen. Mounts will attach to the bottom of the camera. So, let’s look at some home mounts and tripods for the Reolink Keen. Again, we will look at heavier duty mounts to hold the weight of these bulky cameras and will recommend mounts that can be adjusted to get the best angle. Consider the Arkon Camera Wall Mount for CCTV POV Camcorders Cameras. This is a wall mount. Attach this metal mount to a wall and use the three adjustment points to get the proper angle. If you don’t mind driving some screws into your wall, this makes a great mount. Unlike placing the camera on a table, it sits unobstructed perched to this mount. Nothing will get in the way of the rotating lens. It can articulate in a complete circle and see all around it. A good heavy duty suction cup mount like the Fat Gecko Mini Camera and Camcorder Mount is a well made mount that adjusts at the base and tip sufficiently to get the right angle for the best video when mounted on a window. The three-inch suction cup has a vacuum lock for a more secure hold. There’s an extension arm included with the mount that we suggest using to make it easier to get the right angle. It’s going to attach to the camera using the tripod hole on the bottom. The mount is made to hold up to four pounds, so the Reolink Keen will fit just fine. Lastly, let’s look at a traditional tripod. Consider the Acuvar 50″ Inch Aluminum Camera Tripod which will work fine with the Reolink Keen. Just screw the bottom of the camera to the tripod and adjust the head. Be sure to place it in an area where you will not knock it over. Also think about ensuring children or pets not knocking it over. The camera is easy to install and remove from the tripod. Just a matter of turning it so the tripod screw attaches to the bottom. Any of these three mounts will work well and help get even better video angles on your Reolink Keen. All are well made and support the screw hole on the bottom of the camera. The same company makes a real nice outdoor camera and we covered mounts for the Reolink Argus in another article.